I am a touch-texture person. You know the type of person who walks down the isles touching everything as they slowly peruse for anything worth purchasing. Yes, that is me. The texture has to be just right for me every time. I sometimes feel like Goldie Locks… “This is too hard, this is too soft, etc.” Imagine a person like me trying to find the best blanket to wrap my sweet angels in when they are newly born. It is certainly a task for me to be completely satisfied. I want my baby to feel warm, protected, and comfortable at all times in their blankets. I want the blankets to provide protection from the elements, no matter what they may be. Whimsical Charm is a line of unique baby blankets that does just that. They offer elegantly designed blankets that provide warmth, comfort and style in various sizes and fabrics. The Whimsical Collection features multiple colors and embroidered designs for baby boys or girls. This blanket is by far the softest baby blanket I have ever owned. Even my 4 year old picked it up and without prompting snuggled it to her face and said, “It is so soft. 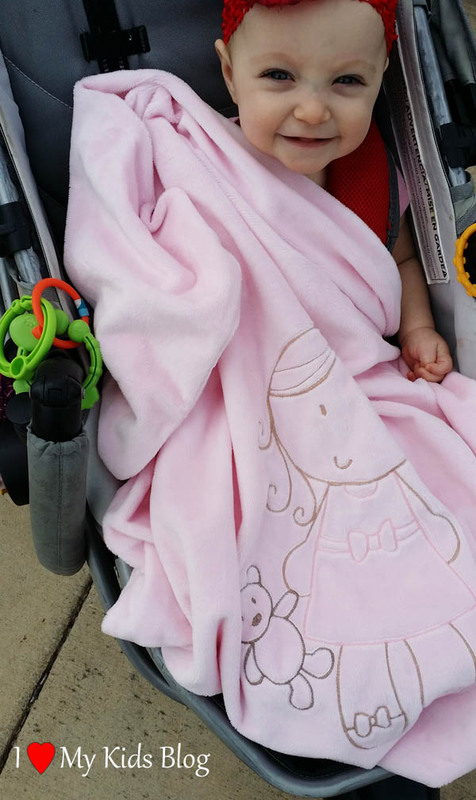 It is so so soft!” At first I was concerned the blanket may be too thick and heavy for use out in the humid spring heat, but it breathes well and provides my baby with exceptional comfort and protection. When it comes to naps and/or bedtime, the comfort of this blanket soothes my baby day and night. A few days ago I was talking to my husband about how much my daughter loved her new blanket and he asked me to go get it so he could see and feel it. I went into her room to get it out of her crib for a moment, only to find that she had literally wrapped her arms tight around it so that it was firm against her face and body. I returned to talk to my husband empty handed, to which he replied, “She has never done that with any of the other blankets before. She must really love this one.” He is absolutely right. My daughter, who is 6 months old, loves this blanket. 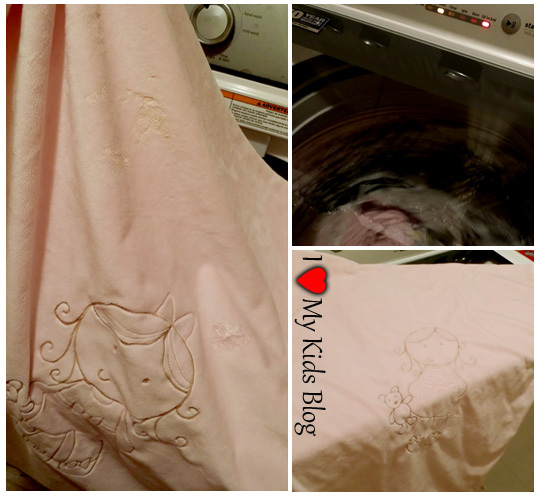 Since my daughter has been using this blanket non-stop, both indoors and out, it came time to wash it. I don’t know about you, but when I have to wash something for the first time that I adore, I get a little nervous. I worry that perhaps the fabric won’t wash well, the softness of the blanket will be lessened once it comes out of the dryer, or that the fabric will shrink, making it uneven and unusable. After washing the blanket on my normal settings I found that it was softer than it was when I first got it and it cleaned well. I am impressed that it was so easy to clean and that it stayed as perfect as it was before it was washed. Sometimes blankets can take a while to dry, especially if the fabric is denser then others, however this blanket when dried alone, was ready for snuggling again with only 15 minutes of drying time. This is a blanket I would recommend to anyone who is looking for the perfect combination of warmth, comfort and style. It rates very high for a touch-texture person like myself. Would you love to have this blanket for your little one or a person you know? 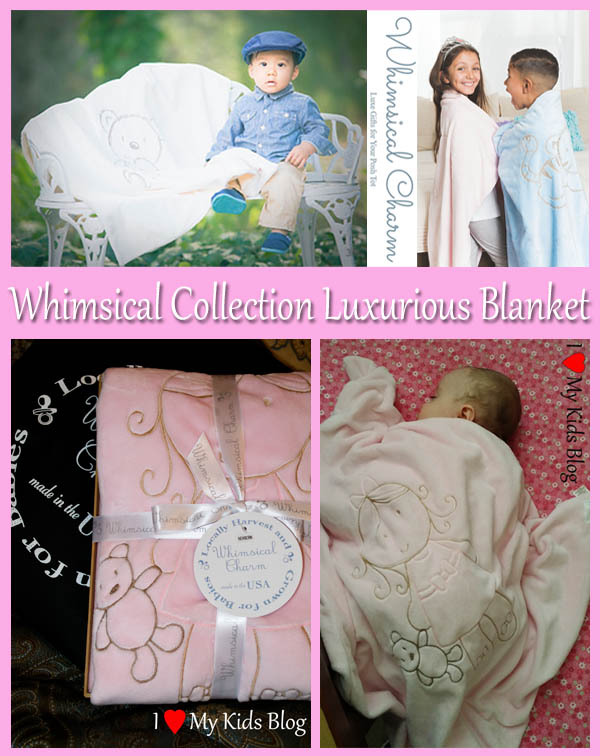 Whimsical Charm is giving one lucky reader a FREE Whimsical Collection blanket of your choice! To enter just fill out at least one of the entries on Rafflecopter form below! This contest will end March 20, 2016 at 11:59 pm Eastern time and is open to US only. Special thanks to Whimsical Charm for providing this giveaway! Good luck! Winner will be chosen randomly by 3/21 and be notified by email. The winner has 48 hours to respond, or a new winner will be chosen, and so on and so forth. The prize will be fulfilled by the sponsor. If I won I would get the ivory bear ? I’d pick one of the pink blankets. They look so soft and comfy! I’ve got a brand new baby great niece I would send this to ? Having felt this thing, holy cow soft! If I won, I would get the tiger in baby blue ? 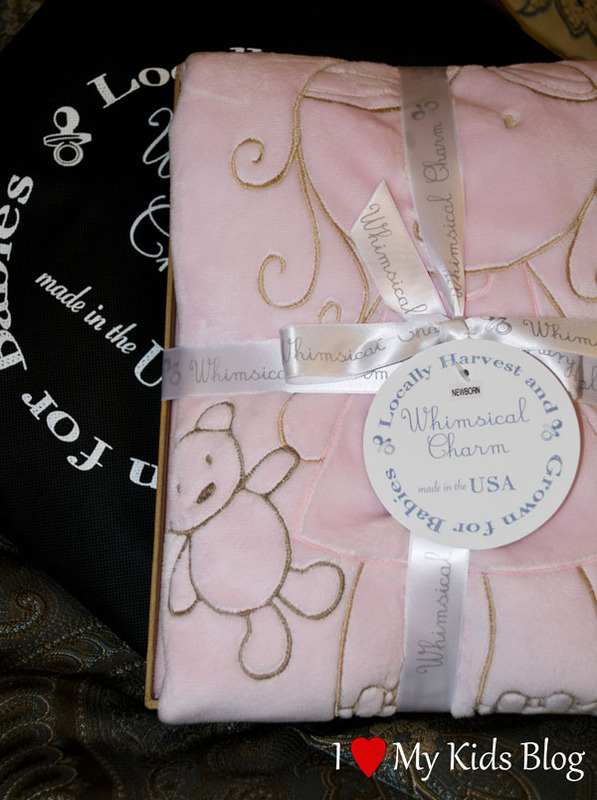 I would choose the Bear Embroidered Blanket – Baby Pink. It tough to pick from those adorable collections, I would pick the bear blanket in pink for my daughter. 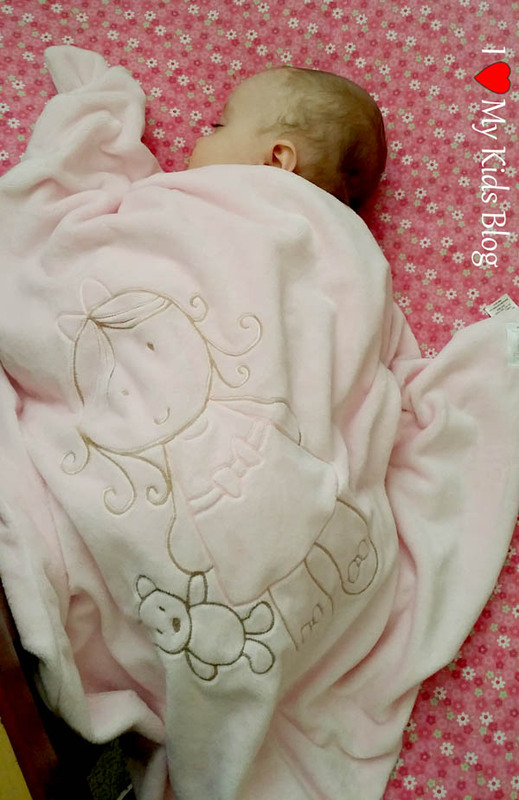 I really like the Bear Embroidered Blanket – Baby Pink . But hionestly, that was a hard choice as they are all so cute. Thanks for the awesome opportunity! I would love the Lil girl blanket in pink! That is a beautiful blanket. I would choose the Bear Embroidered Blanket – Yellow! I would choose the Bear Embroidered Blanket – Baby Blue. The all are beautiful, what a sweet blanket for our little ones to cuddle with! I’d pick the Lil Girl blanket although I love the Tiger but I think dd would rather have the pink than blue. Tiger Embroidered Blanket – Baby Blue is what I would chose. If I won, I would like the Lil Girl Embroidered Blanket-Baby Pink. I would get the yellow monkey blanket. I would choose the Lil Girl Embroidered Blanket – Baby Pink. So cute! I love the Mint Bear Blanket! I would choose the Bear Embroidered Blanket in Baby Blue! I would choose the Bear Embroidered Blanket – Ivory.